If you’re looking to transport your boat to another location, it is important to properly prepare so that it arrives in pristine condition. Making sure that everything is safe and secure inside is one thing, but the only way to ensure a perfect trip is by shrink wrapping. There are few tips and tricks to remember when preparing to transport your vessel. -Be sure to secure all loose supplies above and below deck. -Remove or store and secure any personal or valuable belongings. -Close and secure any hatches. -Disconnect any batteries and secure any cables away. Now, let’s get shrink wrapping! Dr. Shrink has put together a complete step-by-step guide on how to shrink wrap your boar for transportation. See below and check out our shrink wrap products! 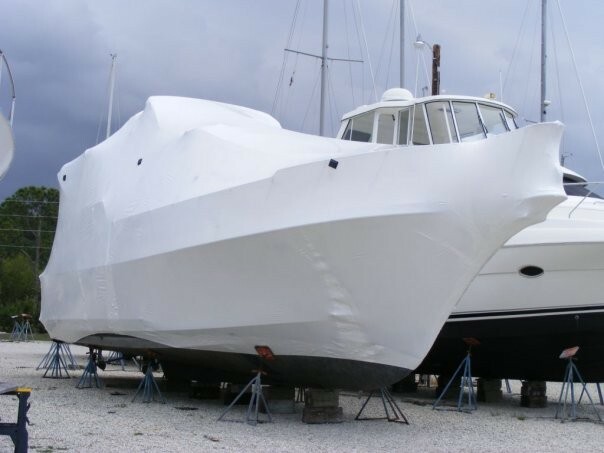 Installing a shrink wrap transportation cover using 4” hull tape to hold the cover onto the boat is a quick, durable, and cost effective method of protection. Pad sharp objects on the boat and also all items such as vinyl interiors that could be damaged by excessive heat. Generally, one layer of shrink wrap over vinyl will be sufficient. Place anti-chafe tape on all areas that may be abraded, including vinyl graphics. Tape over the fuel vent to prevent fumes from escaping. Determine how far down the hull sides the shrink wrap will come. 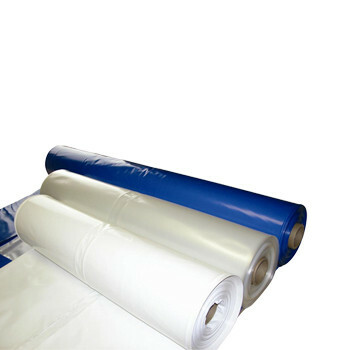 The shrink wrap should cover all vinyl graphics so that the hull tape will not adhere to them. This step is very important—the hull must have all wax and mold releases removed from the hull where the hull tape will attach to it. Use rags and isopropyl alcohol (rubbing alcohol) to clean a swath along the hull at least 8 inches wide. This will assure proper adhesion of the tape. Install a simple support structure by running ¾” strapping from one cleat on the stern through the cleat, or to the top of the rail, on the opposite side at the bow, then through the other bow cleat, or rail, to the opposite stern cleat. You should have a crisscross pattern. Pull it tight so that it will support the plastic. This should be done on all boats and gives extra support in case the covers are left on for extended periods. Pull the shrink wrap over the boat making sure it doesn’t touch the ground. Static electricity will allow the shrink wrap to pick up dirt and grime and will affect the shrinking and adhesion of the tape. Once you have enough wrap at the bow, tape it below the rub rail on each side to hold it in position. Now cut the wrap at the stern 4”-6” below where it will be taped on. Trim the wrap in the center of the transom and tape it to the hull. Now that the material is taped fore and aft it will be held in place while it is trimmed completely around the hull using a Dr. Shrink’s Film Cutting Knife. Use of this tool will give a straight line around the hull making it much easier to tape, plus the knife cannot damage the hull or cut employees. Before you begin taping the shrink wrap to the hull form the pleats at each side of the windshield. Fold them towards the stern, pull the plastic until it is taut, and tape the wrap to the hull at that point. Now the entire cover can be taped to the hull using 4” hull tape. Start at the bow or stern and tape as closely as possible so that the tape is halfway on the shrink wrap and half on the hull. Rub the tape to eliminate air bubbles under it. Always cut the tape rather than tearing it—rough edges allow moisture under the tape which kills the adhesive. Make sure the tape is sticking tightly to the hull around the transom and swim platform. The cover is ready to be completely shrunk after step. Begin at the bottom of the cover at the bow or stern using the heat tool as though you are spray painting. Note: this is not flame retardant shrink wrap. It can burn. Keep a fire extinguisher nearby at all times. Shrink up to the rub rail around the entire boat before shrinking the top. This will pull the excess out of the top and provide a much tighter cover. After the cover is totally heated go around the boat and repair any holes with hull tape. The most important steps are: 1. Padding sharp objects, cleaning the hull of all waxes and release agents, and taping the fuel vent. 2. Cutting the shrink wrap in a straight line around the hull. 3. Applying the tape equally to the wrap and hull, then rubbing the tape to eliminate air bubbles under the tape and help assure complete adhesion. 4. Running ¾” strapping fore and aft to make a simple, strong support structure for the wrap to rest on.